You've been hearing it all your life, haven't you? It's soulful, food is, with emotional strings attached from infancy. And food alone will NOT a relationship make... But everyone LOVES food... and there's something satisfying in serving up palate-pleasing comfort foods. It conveys warmth and caring. And we advocate men in the kitchen, too! It goes both ways, guys. Get a little cooking direction for yourself from our website. You can not imagine how many points you would win for presenting your woman with a juicy steak, baked potato and a crisp green salad... and it's easier than you think. Grab ahold of our new cookbook... for a great collection of easy, soul-satisfying recipes that will help make your culinary pursuits more enjoyable and successful... for both of you. Grillin' & chillin'... oh, yeah! We list here a handful of our favorite classics. This took a lot of thought, and some really good books didn't make the cut. But we wanted to keep it simple and manageable...These books would start an excellent reference library for your kitchen. Get these first, then add specialty cookbooks as your skill grows. 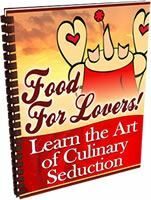 And don't miss our new lovers cookbook entitled "Food For Lovers!" The key to becoming a good cook... you can easily teach yourself! Read these books carefully...not just the dishes, the information... then follow the recipe directions exactly... (Joy Of Cooking is great for this). Soon, you will come to understand what you are doing... and in no time, you'll be whipping out gastronomic masterpieces! Now we share with you a small collection of our favorite recipes and most memorable romantic dinner menus... all are beloved time-tested dishes! ...for a quick dinner alone or weekend entertaining. Here's the thing about a man and his barbecue...he pits himself against the elements (Fire), reveals supreme skill and talent with his tools (grill and utensils), and emerges victorious (by serving up a killer steak or rack of ribs). 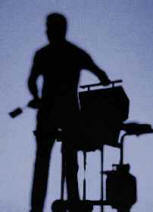 It's quite a thrill for him...that's why he never barbecues alone or wants help from his woman (less glory).